Bake 18 to 20 minutes or until toothpick inserted in centre comes out clean. Cool 10 minutes; remove from pans to cooling racks. Cool completely, about 45 minutes. In large bowl, beat softened butter and cream cheese with electric mixer on medium-high speed until smooth. On low speed, beat in icingpowdered sugar until smooth and creamy. Beat in strawberry jam and vanilla until blended. Tint frosting with food colour to desired colour. Place one cake layer rounded side down on serving plate. Spread 2/3 cup of the frosting on top. 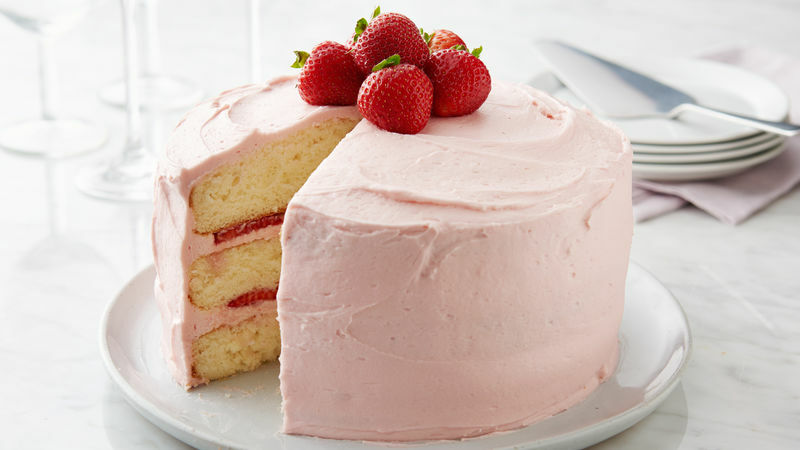 Place in single layer 1/2 cup sliced strawberries on frosting layer to within 1/2 inch from edge of cake. Top with second cake layer, rounded side down. Spread 2/3 cup of the frosting on top and add remaining sliced strawberries; top with third cake layer rounded side up. Frost sides and top of cake with remaining frosting. Refrigerate cake at least 1 hour before serving. Place whole strawberries in centre on top of cake. Store any remaining cake loosely covered in refrigerator. To make a pinker frosting, add a few drops of red gel food colour when adding strawberry jam to butter mixture.